New Old Fashioned, Spirit Fiddle's 4th recording, presents a cross section of original music, folk melodies from North America and Europe, Canadian and Old World dance music, flashy bluegrass tunes, and sweet waltzes. The duo of fiddler Robin Warren and guitarist Brian Clancey is joined on this album by Jason Sawyer on acoustic bass. 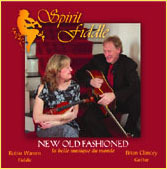 New Old Fashioned Waltz and County Fair (jigs) are original tunes written by Robin Warren soon after Spirit Fiddle played 31 concerts in 10 days at the Topsfield Fair. The Canadian tunes on this album include Jocelyn Waltz, Grand Valley Waltz, and Village Carousel Waltz. Jig Heaven is a medley of 6 jigs (Canadian Fourstep, My Dungannon Sweetheart, Naomi's Jig, Murray River Jig, Time to Eat, and Bill Darrah), and the Errant Fish Medley includes Table Clog, Casa Loma Hornpipe, Philosopher's Reel, and Errant Fish. The bluegrass tunes Foolin' Around and Durham's Bull, and the southwestern contest favorite Jesse Polka round out the North American tracks on the album. Delightful European melodies are featured in this collection. Tra Veglia E Suono (Italian), Le Plus Beau Tango du Monde (French), Lament (Klezmer), and Noche de Ronda (Latin) reflect Spirit Fiddle's love of musette, traditional music played with a modern flair on fiddle and guitar. Many of the tunes feature special effects that cannot be performed live: double fiddle, viola harmonies, in the beloved Home on the Range, 3 guitar parts at the same time.